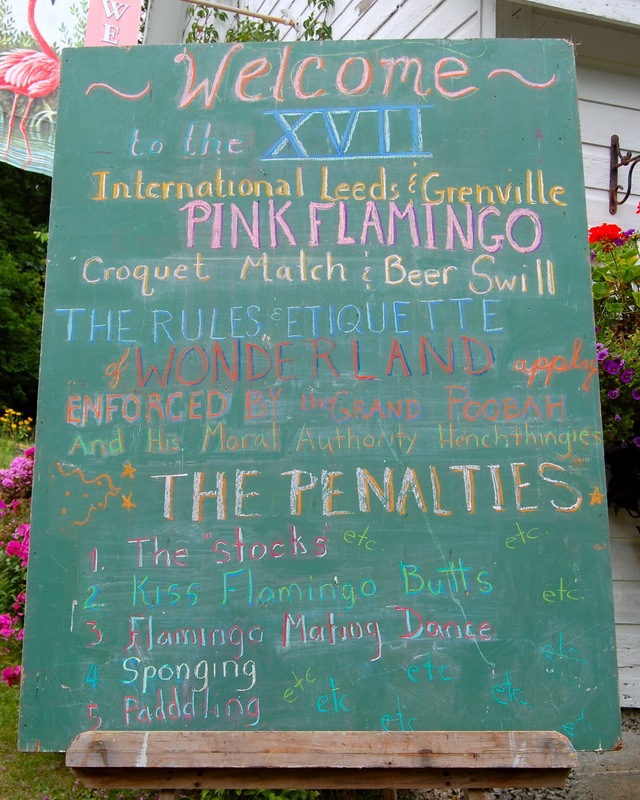 Every summer for the past nine years, B and I have headed down the 401 to the Greater Lansdowne area to take part in the Pink Flamingo croquet match. 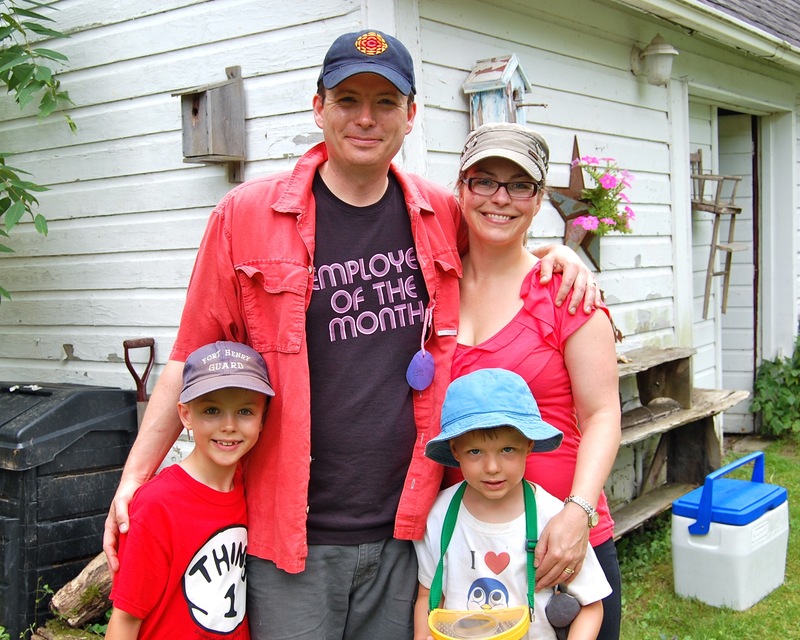 Organized by B’s aunt and uncle, Gerry & Claudette, and a number of their friends, the annual gathering is always one of the summer’s highlights. The event is a pretty wacky affair. 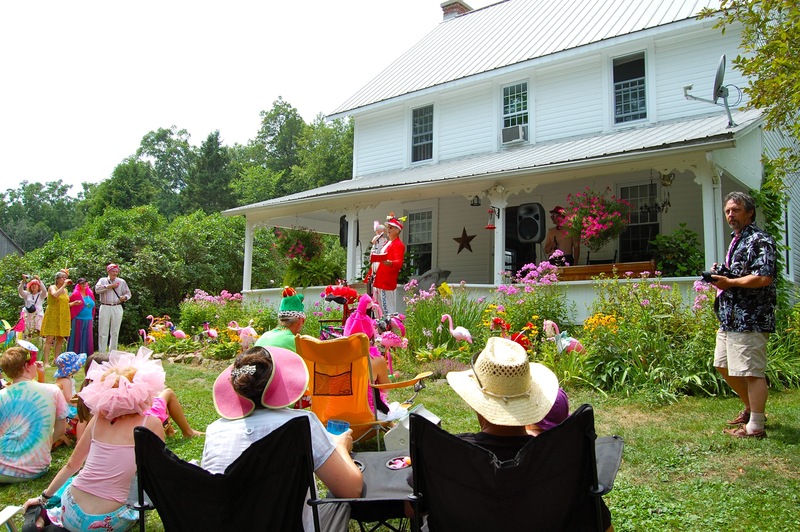 Inspired by Alice in Wonderland, pink flamingos figure prominently, and invitees typically wear bright pink ensembles. Each year, the outfits seem to get more outrageous, with truly breathtaking mou-mous, kaftans, and assorted cross-dressers. Of course, at the heart of the fun is the game of croquet. Around 60 people play in the two preliminary rounds, with just six players making it to the final. While the first round is pretty casual, the semi-finals and the final can get fairly competitive. At stake is a stunning trophy and the chance to be next year’s Grand Poobah. Winning is considered both an honour and a curse. 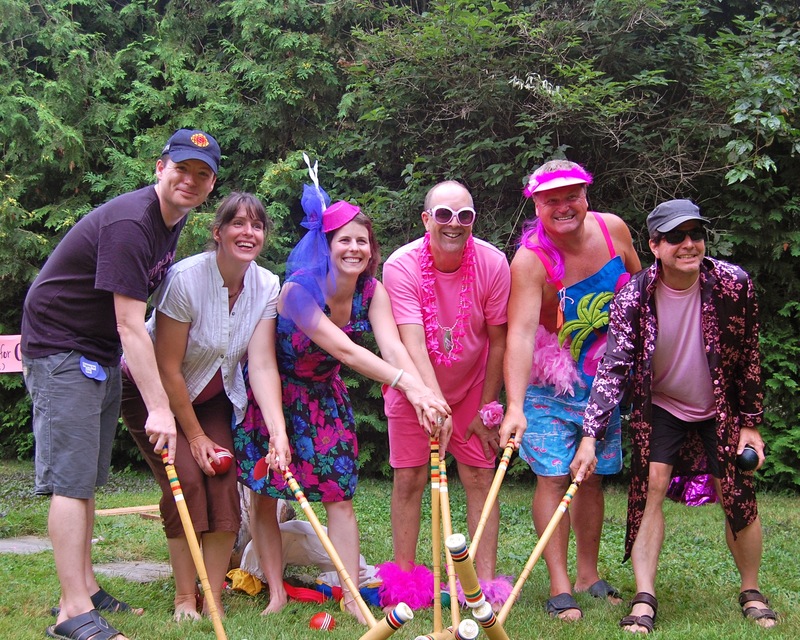 It may sound funny to the uninitiated, but croquet is a very dramatic sport. Games can have huge momentum swings – laggards suddenly jumping into the lead with an inspired run, frontrunners falling apart with one poor shot. The wait between shots can seem interminable as you helplessly watch an opponent roquet your ball into oblivion. It is not a game for the faint of heart. Don’t get me wrong – I’m no expert. The only time I play is at the annual croquet match (where practicing is forbidden). So it was through sheer luck and other people’s misfortune that, after nine summers of failed attempts, I wound up as this year’s champion. I cannot overstate the impact this victory had on my two sons, especially A. He was buzzing around me the entire afternoon, giving me tips, proposing strategy, and repeatedly saying, “You’re going to win, Dad, you’re going to win”. As the pressure mounted in the final, he was a ball of nervous energy – his hands clenched into fists, his body tightly coiled. When victory came, he treated it was as if I’d won an Olympic gold medal. Yes, it’s just a friendly little croquet match. No, it’s not supposed to be competitive. But truth be told, I’m glad I won. My boys thought I was actually good at something, and being the recipient of your child’s unabashed adoration is a rare gift. Here are a few photos from this year’s match. Rules are very important. Key thing to remember is don’t touch a flamingo – the punishment can be severe. The event is held at a different location every year. There’s nothing like spending a summer afternoon at a beautiful country house. B and a colourful group of competitors in the opening round. The six finalists. I am committed to finding an appropriate pink ensemble for next year. 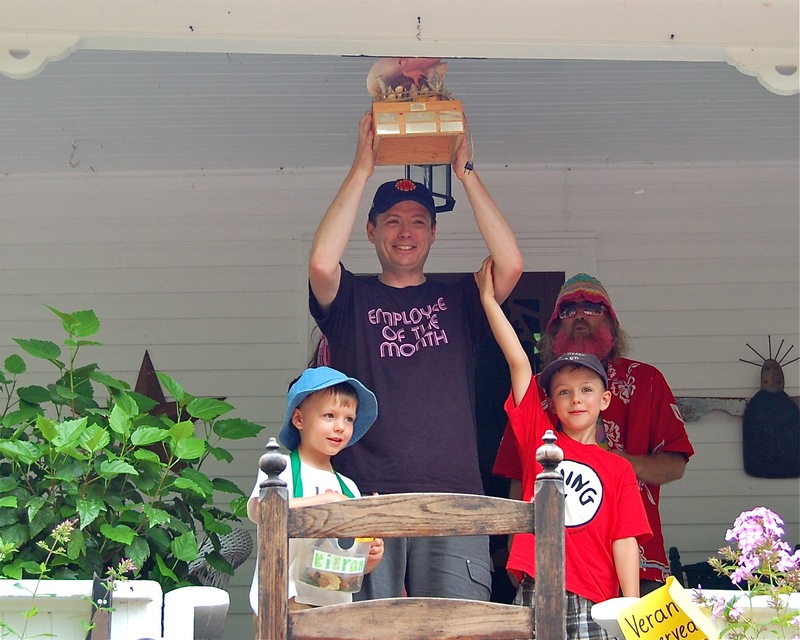 Raising the trophy with the help of my two minions. 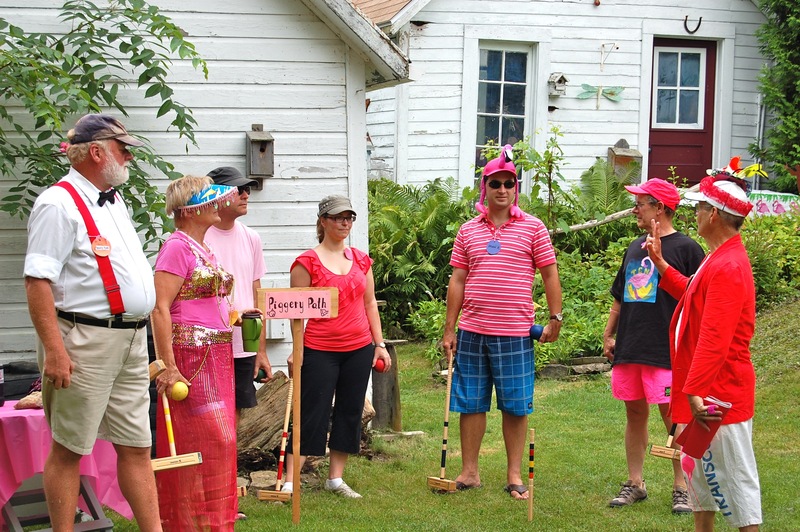 Perhaps now that you are a champion you may come to Bayfield and challenge the poobah of the Bayfield International Croquet Club http://www.bicc.ca/ Pink I believe would be frowned upon by these competitors. Congrats on your victory.